Abby continues to try spinning cotton! Ben and Abby are together again in New York! Ben reports finding his Java Socks, and he's working on them again. Abby is still working on the Dahlia sweater, Shalder sweater and the Kleio shawl. Abby cast on the Lucky 13 Hat from Pretty in Punk. There have been a few bumps, but she's determined to work it out. Ben is looking forward to starting the Herringbone Mittens when he finds his suitcase! Abby continues to do battle with spinning cotton on her Schacht Sidekick. Ben asks our listeners: How do you pack knitting for a trip? Abby keeps patterns on her Kindle or her iPad and can access documents on her computer using the GoodReader app. Ben is excited about the massive strategy computer game Civilization V which is available on Steam. Abby got a small wrist rest to combat "Starcraft blister" and recommends this! Abby remembered that the construction for Vonica was quite unusual and a bit counter-intuitive. Ben suggests that knitters carry a multi-tool or Swiss army knife or Leatherman. We talk about the Nantucket Bagg which was originally designed as a tool bag/apron and is now marketed as a knitting bag. Latte: Ben races against his yarn to finish another World War II Watch Cap. Abby breaks down the construction of the Dahlia sweater. She struggles with cabling on the Rocky Coast Cardigan, and abandons it to start Shalder. 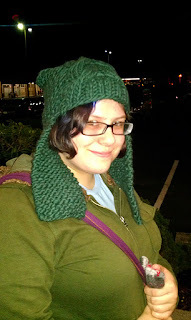 Grande: Ben talks about knitting in public at the bus stop, teaching three needle bind off while finishing the Dragon Slayer Earflap Hat, and receiving a lovely Norwegian Star Earflap Hat. Abby finished the Cat Mittens. Paula from the Knitting Pipeline podcast inspired her to redo a too-tight thumb, and to simply cut into her knitting. Abby finished Strata Sphere, finally! Brewing: Ben wants to knit complex socks. Abby suggested Cookie A , Janel Laidman and Cat Bordhi. Ben is trying to decide what to do with the Aurucania sock yarn and the Burgundy-Magenta Lustra yarn. We talked about Elizabeth Zimmerman's Percentage System, Jared Flood's steeked cardigan, and Jane Ellison Queensland Collection 9. 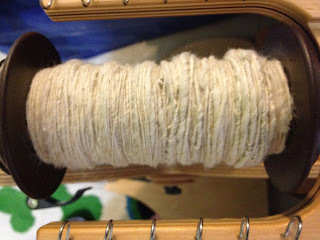 Abby talked about The Knitter's Book of Socks and the new Jean Frost book and reading in depth. Latte: Abby is working on her Dahlia sweater and Shalder, but her Super Secret Socks are going to be frogged. Ben is working on a Weasley sweater and a new knit tie. Grande: Ben just barely finished his World War II Watch Cap, with less than a yard to spare! Bite: Abby asks listeners for advice on The Who-induced tinnitus and how to study for her history exam. Bite Back: Listeners ask: How did Ben celebrate his birthday? He visited a wine bar called Swing. Taste: Abby reviews 60 More Quick Knits: 20 Hats*20 Scarves*20 Mittens in Cascade 220 Sport by Sixth&Spring Books. Brewing: Ben seeks design inspiration from The Clash. Abby wants to spin for the Dragon Slayer Earflap Hat. Caffeinated: Ben is caffeinated about The Roots' new album undun (language on the album is not work-safe) and plays a snippet of "Kool On" after the sign-off. Abby is taking plenty of pictures with Instagram. Bitter Cup: H&M Puts Real Model Heads On Fake Bodies. Chai: The iPhone mugger is on the loose, Abby goes to see Latkes & Hams, and sings the praises of Holiday Markets.